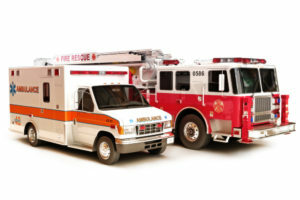 Having emergency vehicles at your company is a big investment. It is expensive to buy and equip it, and you also should take care of its maintenance. These vehicles can be used at private clinics or ambulance companies, as well as other various businesses. Damaging or losing an emergency vehicle could lead to great financial losses for your company. In order to avoid them, you should have emergency vehicle insurance that is able to cover any possible expenses. What kind of California Emergency Vehicle Insurance do you need? The backbone of any auto coverage is liability insurance. It’s important for you not just because it is legally required. If there is an accident and your driver is at fault, this coverage will pay to the victims. Liability Insurance policy consists of two coverages. Bodily Injury pays for medical bills and other results of injuries. Property damage pays for the damage your vehicle has done to other people’s property. Physical damage should be another essential part of your emergency vehicle insurance policy. It pays no matter who is at fault and covers your vehicle. It has two parts: collision insurance and comprehensive insurance. The first part will cover you in case of collision, and the second part will pay in case of any other damage or theft. Make sure your selected limits on physical damage insurance are enough to cover you in any situation. Having Med Pay insurance is also a good idea. If there is an accident, it will cover medical expenses for your driver and passengers. Want to get more info on California Emergency Vehicle Insurance? SafeLine Truck Insurance will be glad to provide you with all the help you need. Our experienced agents will get you optimal coverage at the best rates in the market. Contact us today and get a free quote!